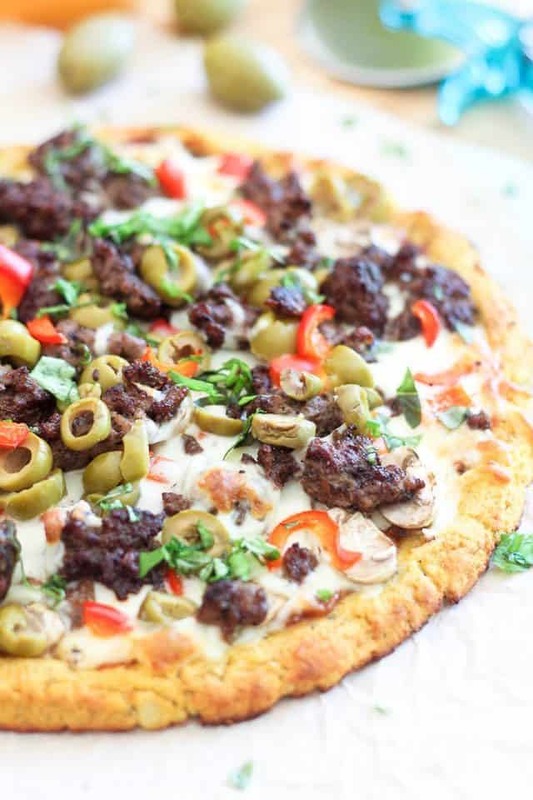 I recently got a major craving for one of my favorite pizzas ever, namely Ground Beef and Green Olive Pizza. I figured it was probably a good time for me to go out and try the classic paleo replacement that is cauliflower crust pizza. I knew of its existence for I’d seen a lot of recipes for it on several blogs, but never was fully inspired to actually go out and make it. As long as grains were still a part of my regular diet, I really couldn’t think of a valid reason for me to make the switch, except for maybe saving myself a couple hundred calories. But for me, the pleasure of biting into a chewy, soft and cracking pizza crust far outweighed the need to slash down a few calories. I’ve since changed my views on the subject and now believe that I’m much better off without the grains, so I figured I was finally good and ready to make the switch. So I asked for recommendations on Facebook and got directed to quite a few yummy recipes. Unfortunately, most of them called for a hefty serving of cheese, which I was not a fan of. If I was gonna have pizza with cheese, I preferred to save said cheese for the top and not add it to the crust itself. Hey, something HAS to be said for hooey, gooey, melting cheese. And so it was decided: I would use the recipes for inspiration, but create my very own, dairy free version. One of my main concerns with cauliflower crusts was that I’ve always been HIGHLY skeptical as to its ability to “stay together”. I thought for sure that it would completely collapse and fall apart as soon as I’d try to lift a slice up from my plate. Well, much to my surprise, it held up just fine! See? I was able to hold my pizza in one hand, just the way I like to eat it. I’ve never been one to eat pizza with a knife and fork, you see. I dunno. To me, that kind of misses the point. I mean, you wouldn’t think of eating a hamburger or a hot-dog with a fork and knife now, would you? Well, to me, same goes for pizza. It’s meant to be eaten with your hands! Why else would it have a crust? And this crust allowed me to do just that. SCORE! Now, of course, the texture is really different from that of a traditional pizza crust. You don’t get much of the crispiness or chewiness that a good bread crust provides. However, its texture is still very agreeable, if you ask me. Hard to describe, but one that I can very well see myself adapting to. It’s sort of firm, chewy and soft, all at the same time! That’s pretty much how I would put it. But the best way to find out, is to try it for yourself. One department in which this crust would be far superior to the classic whole grain crust is FLAVOR! Let’s face it, bread on its own doesn’t have much flavor going on. 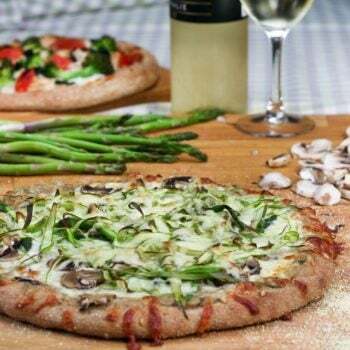 This crust, however, is simply LOADED with flavor, so in that sense, it makes the whole pizza eating experience even better. 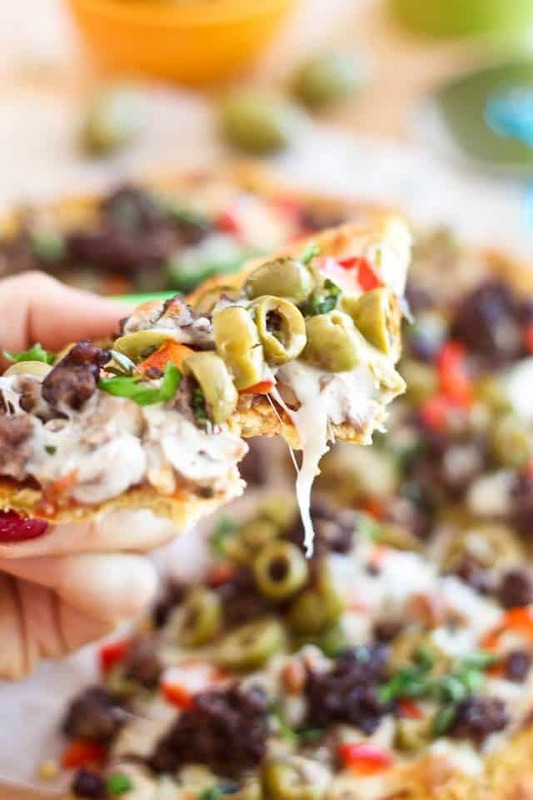 In fact, this crust has so much flavor on its own that I think it would make for a fantastic light meal simply drizzled with some good extra virgin olive oil, topped with a few sliced olives, a handful of fresh herbs and maybe a few pine nuts sprinkled on top. In short, I think I won’t need much more convincing to switch to cauliflower crust for good. 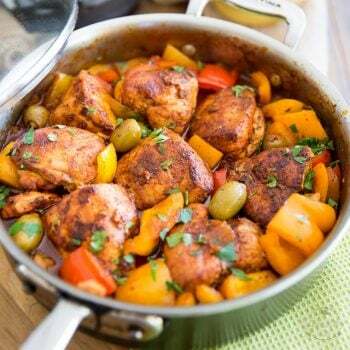 To make the sauce, add onions, garlic and seasoning to a small saucepan and cook over medium heat until fragrant and the onions become translucent, 2-3 minutes. Add canned tomatoes and honey if using and bring to the boil then lower heat and simmer, partly covered, for about 15-20 minutes, until sauce is thickened and all water has evaporated. Reduce to a fine puree with a stick blender, if desired. Set aside while you work on the crust. Place a pizza stone or baking sheet in the oven and preheat oven to 475F. 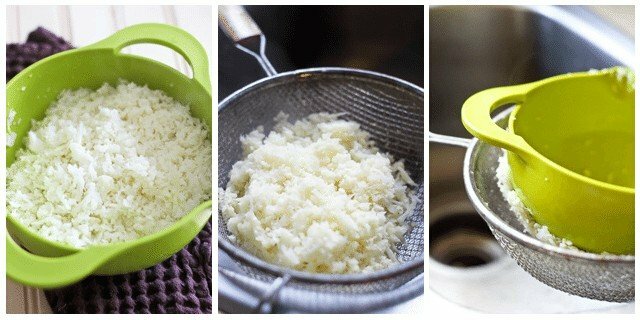 Place the grated cauliflower in a microwave safe bowl and cover loosely; microwave for about 4 minutes on high. Place the cooked cauliflower in a fine mesh sieve and press it down real hard with a ladle or an unbreakable bowl or plate that fits snugly into the sieve; You need to remove as much water as you possibly can, so don’t be afraid to squeeze. If you don’t have a fine mesh sieve, you could also dump the cauliflower onto a clean tea towel, let it cool for a few minutes then wrap it like you would a candy and squeeze the heck out of it by wringing the towel. Add the cauliflower into a bowl, along with the rest of the ingredients. Mix well by hand until all the ingredients are well incorporated and resemble dough. 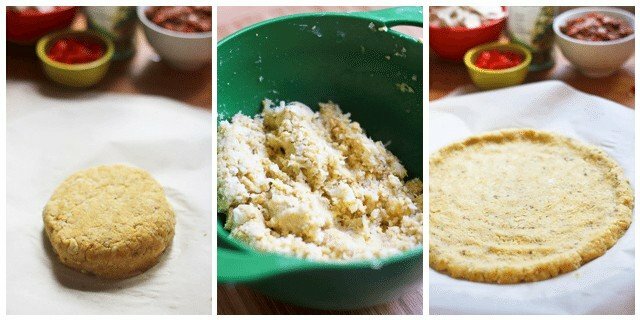 Place a piece of parchment paper onto a cutting board and dump your dough smack in the center. Form it first into a ball, then flatten it down gently with your fingers and form it into a nice, flat disc or approximately 8 to 10 inches in diameter. If you want a ticker border, you will have to also form that with your fingers, as the dough won’t rise. Use the cutting board to slide your crust onto the hot pizza stone or baking sheet that’s been sitting in the oven. Bake for 8 - 11 minutes, until it starts to turn golden brown; remove from oven by sliding it back onto your cutting board. 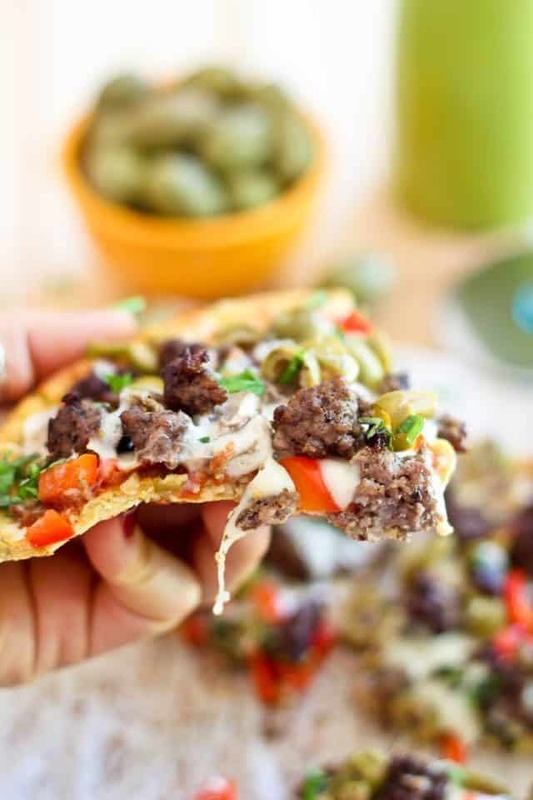 Spread however much tomato sauce you like evenly over the cooked pizza crust; top with mushrooms and half the bell peppers; add ¾ of the mozzarella cheese, followed by the cooked ground beef, the rest of the bell peppers and sliced olives. Finally, add the rest of the mozzarella cheese. Slide pizza back in the oven and cook for an additional 7-10 minutes, until cheese is melted and the crust starts to color on the edge. Remove from oven and let cool for a minute or two. Sprinkle with fresh basil, cut into wedges and ENJOY! This is what the dough should look like when all the ingredients have been mixed together. Form the dough into a ball and shape into a thin round disc. If you want a thicker edge, you’re gonna have to form that by hand as this dough won’t raise! After the crust comes out of the oven, spread however much tomato sauce you like all over the top of your pizza then add the toppings. Can you tell I like mine with LOTS of toppings? Take pizza out of the oven and let it cool for a minute or two. Oh, you’re allowed smelling, too! It smells even better from up here! Even with all those toppings, I was able to hold my pizza in one hand! And it can also be torn into smaller pieces, without completely falling apart! Can you see that this crust really does have a crusty feel to it? 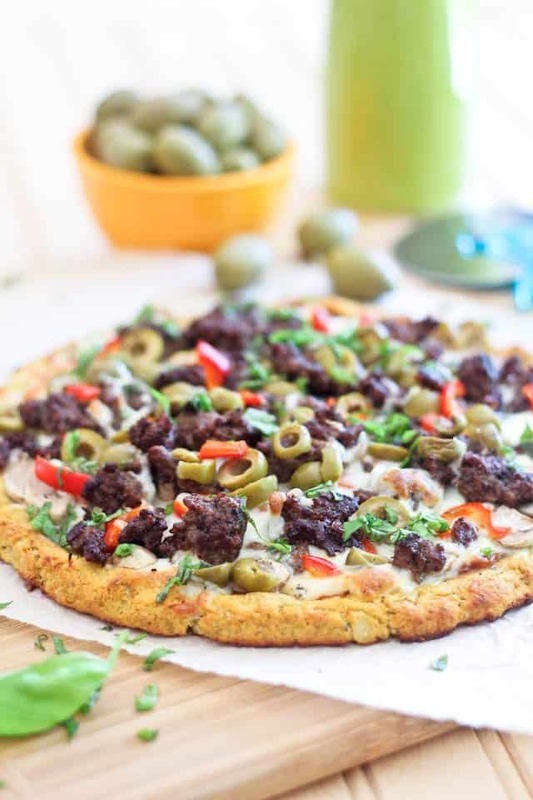 This looks like an awesome version of a Cauliflower Crust- must try! I have a confession to make! I’ve never made the cauliflower crust pizza! And I’ve been doing low carb and gluten free for almost 2 years now! 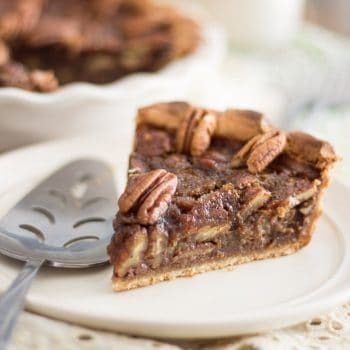 This one has definitely inspired me to give it a try though – and I LOVE the topping combination you used! Green olives? Count me in! REALLY??!?! OMG, I am shocked! You HAVE to give it a try, Mellissa. Have to! I absolutely love cauliflower pizza crust – it is one of my favourite things to make. I love cauliflower crust pizza. The only thing that I wasn’t thrilled with is that there is always a lot of cheese in the recipe. Most other recipes call for cheese in the crust to hold it together like a glue, as well as on top as a topping.I’m trying to cut back on dairy and it looks like you’ve created the perfect cauliflower crust. I can’t wait to try it. Hey, I love the idea, looks delicious! This looks great – I have seen this floating around for a while. I am going to wade in and try it. gorgeous looking pizza! 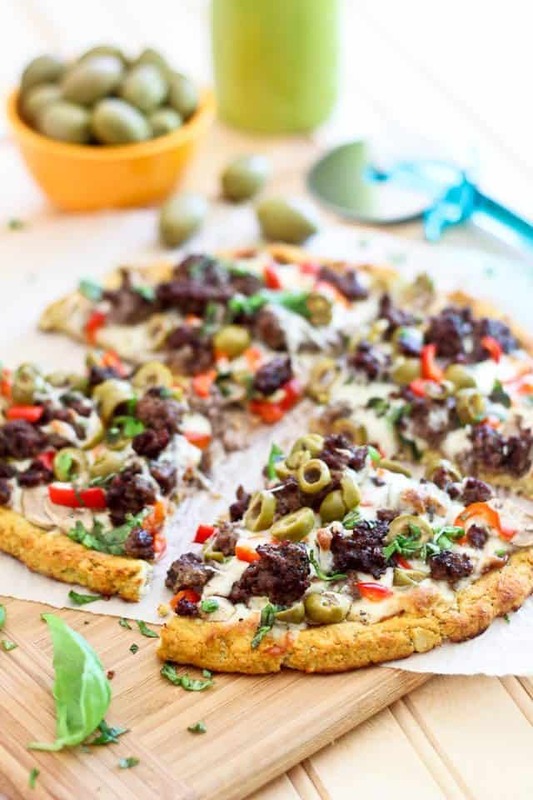 I have to try this cauliflower crust! YES! I will eat all 988 calories of this in ONE SITTING! 🙂 So amazing and I love that there is NO CHEESE!! I want to know why is this so high in fat and cholesterol and sodium? I am curious why is this so high in fat, cholesterol,and sodium? Are the calories in the nutrition information for the entire pizza? I love your pizza. They look so yummy! I’ll try to make it for my family some time. Thanks for the recipe, Sonia! 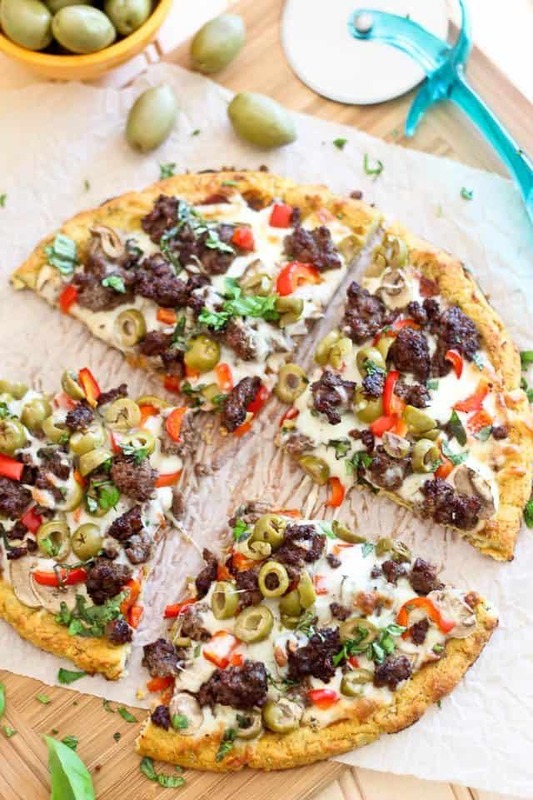 I love to make and eat pizza and this Cauliflower Crust Pizza with beef stuff is going to be my favorite Pizza. Thanks Sonia for this delicious recipe.. I love that your toppings aren’t hidden by cheese. I’m going to put the cheese on before the toppings from now on – brilliant! That sounds lovely, I sure will have to give it a try! Thanks for the suggestion! Is there a way of doing this without using a microwave? Sure! You could steam the cauliflower in a steam basket. That would most certainly do the trick! how long would you recommend steaming it for? i dont have a microwave either! Until it’s really nice and tender. The cauliflower needs to be really well cooked for this recipe. Ooof, I really don’t know Caitlin, I’ve never tried any other flour in this… I take it you could probably use oats, but you’d have to use significantly more since it’s not as “absorbent” as coconut flour. Buckwheat I wouldn’t recommend because of its really strong flavor, which I don’t think would work too well with this crust. As for spelt, well, while it would probably work, it happens to be a form of wheat, and you said you wanted to use non wheat based flour, so I think it’s out! 😉 Personally, I would probably use almond and add a few tablespoons of tapioca flour. Let me know how your experiment turns out, will you? my crust was crumbling and fell apart. please advise. flavor awesome! Hard to tell without retracing your steps, Emma… I personally never had a problem with this crust and I made it quite a few times, so I really have no idea, sorry. Wish I could be of more help! I had the same problem. Really dry and fell apart. do you know what i could so to replace the eggs. Do you know of a substitute for the nutritional yeast? Or if I would be able to omit it completely? You can just leave it out, Nina. It’s there mostly for flavor. try raw tahini, that is what I used, it has a simiiar flavor! I’m looking forward to making this for my pizza-loving son! I made this rather sceptical of the Cauliflower base however that was the best bit! Amazing recipe and I will certainly make again, although the base fell to pieces when I tried to move slices to a plate making it more like a pizza bake! Still, amazing flavour. AWESOME recipe!!!! Can not wait to try it this Friday for our family movie night. Thank you so much for sharing your great creativity. 🙂 One quick question… would 350 grams of shredded cauliflower equal 2 1/4 cups? Thank you!!! I wouldn’t know about cups measurements, Stephanie (I’ll definitely have to check that next time I make this recipe) but 350g is roughly half of a large head. You don’t have to be super precise with that measurement either. What really matters is that you remove as much liquid as you possibly can from the cooked cauliflower. Really squeeze the bejeezus out of it! Thank you! Looking forward to making it!!! How many calories is just the crust? I am trying to calculate calories with different toppings. Thanks, so excited to try! What are you using to calculate calories, Anna? 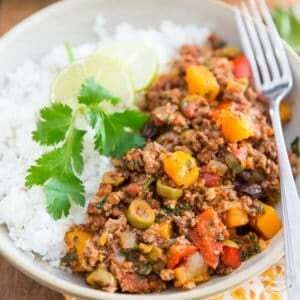 Ever tried the recipe analyzer tool that’s available on caloriecount.com? That’s what I use. You could easily add the ingredients for the crust and get a complete nutritional portrait for your final product! This looks so amazing and I am dying to make it! However, I don’t have a microwave. 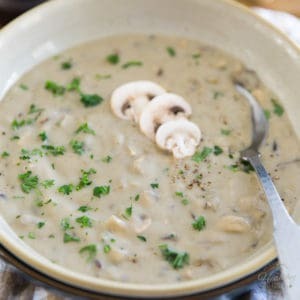 Any suggestions as to how to make this without microwaving the cauliflower? Can I boil it? Many thanks! I strongly recommend steaming, Julia. Do you have a steaming basket? Just set it over salted boiling water, cover and steam for 10-15 minutes, until really tender. Hi, so I made your cauliflower crust recipe, and it turned out wonderfully. I only made a couple of minor adjustments – I roasted the cauliflower at 350 until tender, adding some ghee and salt in the middle of the roasting process. I thought it would add to the flavor profile to carmelize the cauliflower, and I think it did add to the final flavor. I still wrung it out to get rid of the extra water. The only other change I made was substituting two tablespoons of raw tahini for the nutritional yeast, because my husband and I are avoiding yeast products. I thought the tahini would have that similiar “twang” that the nutritional yeast has, I love the raw tahini by Gobel’s, that is the brand I used. Everyone loved the pizzas! ( for toppings, I used roasted peppers, tomatoes, and sauteed grass fed beef with onions, plus chili powder and other seasonings. I wanted to also let you know that I used this same dough to make a delicious quiche! I had enough dough to make another pizza, but only half as much toppings as I thought I would need. I pressed the dough into a glass pie pan, and the amount was perfect to make a beautiful crust up the whole side of the pan. I put in the toppings, and five or six whipped eggs with salt and pepper, and baked for 40 min at 350. For the last ten minutes, I wrapped the crust in foil so that it wouldnt get burnt. It turned out so deliciously, the crust was beautiful, flaky and browned on the edges. I will definitely make again, and experiment with toppings. Thank you so much!! Love it ALL! Love the idea of roasting the cauliflower, love the addition of ghee and tahini, love the toppings that you used, and LOVE LOVE LOVE the quiche crust idea. 1) since the mozzarella is dairy, is it still ok to use if I’m following Paleo? 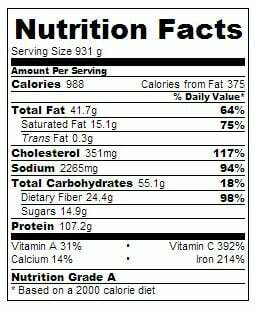 2) I’m confused as to why the nutritional values are VERY high! Is that accurate? For all the veggies and stuff I was just surprised to see how high the values were. Thank you for sharing your recipe and amazingly delicious looking photos! Can’t wait to try this and see what else you have ! Dairy is like a big gray zone of the paleo world. Some do it, some don’t. I guess it all comes down to how well you tolerate it. Personally, my sinuses can’t handle it. I get stuffed for days whenever I have dairy, so I have now decided to eliminate it from my diet. Plus, the only cheese that I can fairly easily get my hands on around here is the commercially produced stuff that’s been stripped of all its nutrients, so I’d much rather pass anyways. 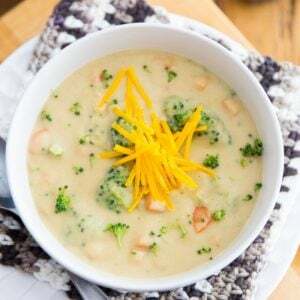 I’m surprised that you would find the nutritional values high… it’s funny I was just looking at that recipe a few days ago and thought to myself that it was surprising that there would be so little calories and carbs in such a large meal! I mean, look at all that cheese and meat, and the size of that crust! This is a meal and a half, let me tell you! Thanks for a reply! I’m still looking up things about Paleo and I’m glad you answered the question about cheese. Dairy does seem to be a grey area like you said. I will be subscribing to your blog! Can’t wait to learn more…. Ah, but almost half those carbs come from dietary fiber, so they don’t really “count” as carbs, from a low carb or keto diet standpoint. 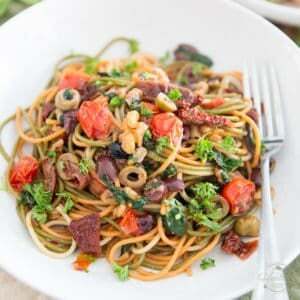 What you need to consider is total NET carbs, which is total carb minus dietary fiber. At a little over 25g of carbs for the entire pizza, I would definitely consider this a low carb meal, especially since there’s a good chance you could never polish the whole thing off. Like I said, this is a fairly LARGE meal, and very filling. And you’re right about paleo not being keen on counting calories and stuff, but it’s still a good idea to get some sort of an idea of what goes into your body in terms of nutrients, that’s why I still like to provide that information. Since switching to paleo, I stopped counting every calorie and tweaking all my macros like I used to, which has been extremely liberating, but from time to time, I still feel the need to crunch in the numbers and see where I stand. Sometimes, I tend to drift a little bit towards the “high-carb” end of the scale… it’s good to be able to get things back in line. Oh, and re: dairy – Pretty much all those who do it do it in moderation, i.e. no more than once or twice a week, or even less. Dairy is mostly considered a treat and for most, falls into the “20” portion of the “80/20”. 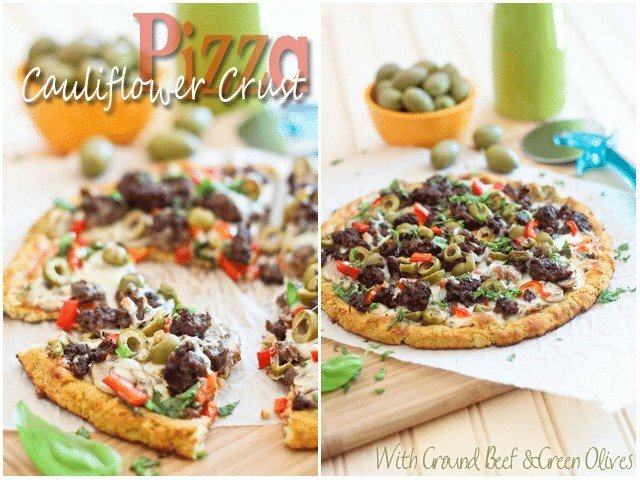 Tried this today, it is the first cauliflower pizza crust I have tried and it was perfect! It actually helps in keeping the dough together, Angela, so I wouldn’t really leave it out. 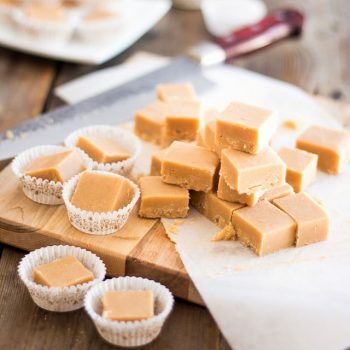 Perhaps you could sub tapioca starch, arrowroot powder, flaxseed meal or just add a little bit more coconut flour. I am newly on gluten free and almost dairy free diet and I miss pizza. Can the cauliflower be cooked in any successful way other than in the microwave? I avoid using it as much as possible. Sure, you can cook it any way you like, Duna, although steaming it would be the best alternative, I think. Just make sure you still squeeze ALL of that water out of there, regardless of the chosen cooking method. Do you know if I could bake the crust a day in advance and put the toppings on the next day and throw it back in the oven. Going to a pizza party at someone else’s house out of town. I want to take this with me so I have pizza to eat. I’ve never tried it, Laurie, but I’m pretty sure it can be done. It’s very well worth a shot! Wow! I definitely want to make this! Looks delicious! Can I do away with the nutritional yeast? Can’t have that. You most certainly can, Blu. Its sole purpose it to add a little bit of a cheezy flavor to the crust, so you can definitely leave it out. I have a semi-professional pizza oven. When I do ‘classical’ pizzas for my family, they cook in just 2 minutes (I set 840°F on the top and 560°F on the refractory brick baking surface). For the paleo cauliflower crust, you indicate a baking time of 8-11 min. plus 7-10 min. Do you think the cauliflower crust could be baked in a lower time using my high temperatures? Hello Sonia. My name is Dan and I am a founder of Easy Fast Recipes website. 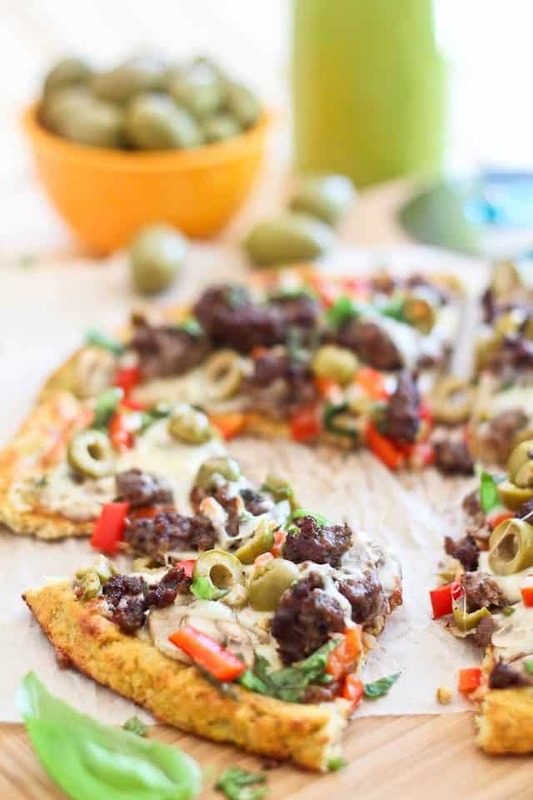 Many thanks for this lovely Ground Beef and Green Olive Cauliflower Crust Pizza recipe! Natural, simple and affordable ingredients, easy to follow and very detailed step by step instructions. I am a Paleo diet follower myself. This is yummy easy fast recipe and I think it’s going into my bookmark list. Keep up the good work. 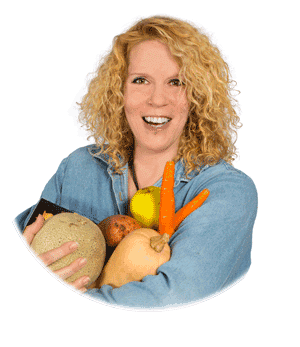 I am looking forward for more Paleo easy food recipes on your great site in the nearest future. 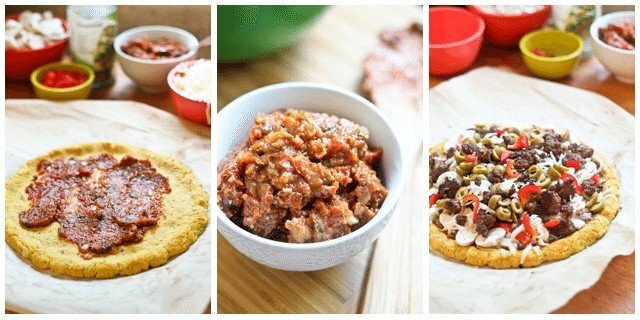 You are welcome to visit my website >> http://easyfastrecipes365.com. Easy Fast Recipes for Healthy Lifestyle & Fitness. Cheers and do have a great day! Thanks Dan, please let me know what you think if you ever get around to actually make the pizza! Such a great recipe! I had tried another one before, but decided to try yours (after all, your paleo mayo recipe is a real hit with me!) and I do prefer this one. It didn’t fall apart even with all my toppings. And I ate the whole thing….I didn’t want to share this one! I look forward to trying even more of your recipes. Thanks a lot for sharing this recipe. I definitely want to make Cauliflower Crust Pizza Looks awesome!!! Wondering if u have ever tried this by making dough into a thin rectangle, baking it and then cutting into “noodles” to use in Lasagna?